Twitter’s active user base has grown to more than 200 million, with an average of 400 million tweets posted every day. Sixty percent of Twitter users log in via mobile devices. Mobile growth is contributing to an impressive growth in ad revenues, as eMarketer forecasts $950 million in total ad revenue this year, with more than half generated by ads seen on mobile devices. Twitter advertising is different from most of the online advertising options out there, with elements of cost-per-click, display, and social media ads allowing advertisers to grow their business in 140 characters or less. Like other social ads, advertisers can form a relationship with consumers directly where they can engage with and share marketing messages. Ads become part of the discovery process on Twitter with ads appearing in content and integrated into the users experience. They appear to be more relevant since they are shown using targeting techniques that focus on interests, similarity of the followers, geography, and more. A unique feature to Twitter ads is that users can engage on multiple levels with the ads on a desktop computer or mobile devices. For example, users can click on links, @reply to the ad message, retweet to share with followers, or favorite it in their public list. All of these social options are a nice bonus and differentiate it within the online advertising landscape. Promotions: Recommended for time sensitive events with a sense of urgency. Twitter users are following brands to get information on discounts and free stuff. Followers: Pay-per-follow to grow the follower base and leverage this audience for future promotions and dialogue. Top Tip: Consider using Twitter ads to promote content as part of your content marketing strategy. 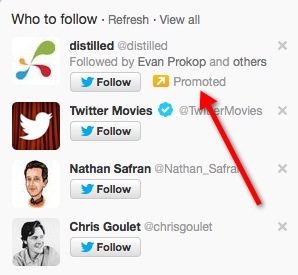 Twitter has three ad products. Let’s look at each. The Promoted Account ad goals are to increase the number of relevant followers to a Twitter profile. The ads are featured in Twitter search results and within the Who To Follow section. Promoted Accounts are suggested to users based on ad targeting on desktops and mobile. A recent beta enhancement serves ads appearing in the home timelines on mobile devices. The new ads format allows for “ad copy” in the form of a tweet to be shown with the ad. Top Tip: Use the new ad copy feature to communicate to users “what’s in it for them” to follow your brand. Promoted Tweets appear directly in the timeline among non-paid tweets. Twitter regularly analyzes the engagement rate of the advertisers tweets to identify five of the most engaging to create an ad to serve to users automatically. Advertisers can also select specific tweets that can be changed anytime. Lead Generation Cards are a new ad format offered for Promoted Tweets. These allow advertisers to automatically capture user data directly from within a tweet with a single click. The creative portion of the card contains the promoted tweet, short description, call-to-action, and the added bonus of an image. Lead data can be sent to the advertiser or simply downloaded from Twitter. This ad format will display on Twitter.com, iOS, and Android clients. Promoted trends are featured next to the users timeline on twitter.com among the organic Twitter trends and are tailored for users based on location and who they follow. Ads appear at the top of the trending topics list. These ads also appear on Twitter for iPhone, Twitter for Android, and Tweetdeck. Promoted Trends are currently in beta with a small selection of advertisers. Targeting ads on Twitter has come a long way in the past year. Targeting varies slightly per the ad format, but generally the options are much more granular and behavior driven. As targeting is selected, the estimated audience size appears on the right side of the web interface. Updates reflect new audience totals. Interests: Interests are grouped in several Categories from automotive to travel. Adding more user names and interests can expand the number of people to reach. Followers: Adding a user name targets people similar to that user’s followers. Keywords: Target users or searches containing the specified keywords. Keyword matching is allowed to control the relevancy of the matching including broad match, phrase match, exact match, then two versions of negative matching in broad and phrase match. Searches on trending topics can be automatically targeted as an option. Advertisers may also want to use the option of excluding tweets in which keywords are used with negative sentiments. Television: Also known as TV conversation targeting, this is available for U.S. advertisers running national TV ads who have Twitter account managers. It allows targeting people who are talking about specific television shows. Twitter uses an algorithm to identify people likely to have seen a television show, in part by their tweets during the airing of the show. Devices or platforms: Choose from a variety of options of mobile OS types and desktop and mobile web. Geography: Enter countries, states/regions, metro areas, or postal codes most relevant to your campaign. Gender: Males, females, or “any” options. Tailored audiences: Using customer data, Twitter will match a user’s account to information shared by ads partners for targeting ads. Data that can be used includes cookie IDs, email addresses, twitter IDs and must come from a specific Twitter ad partner. The cookie ids provide retargeting opportunities. Once the strategy is planned for tailored audiences, work with the ads partner to prepare the audiences and send them to Twitter, to target. These audiences will be available in the account and can be used to target or excluded from campaigns. Top Tip: create multiple campaigns with different themed interests to control costs and better link performance back to interests. Budgets and bid settings on Twitter are found at the campaigns level to set a maximum amount to not exceed. Daily budget determines how budget will be managed and once the daily budget is reached the ad will no longer show. There are options to control the pace of serving so ads are served evenly thought the day or accelerated as quickly as possible. Promoted Account ads are priced on a cost-per-follower (CPF) basis with advertisers only paying for new followers gained. The recommended bid I see to start is $1.50 to at least max of $2.20. Promoted tweets use cost-per-engagement pricing. A Twitter “engagement” is user clicks or action on the Promoted Tweet (a retweet, reply, favorite, or follow). The advertiser only pays for the first engagement. Twitter isn’t shy about noting that a higher bid will increase the likelihood of ads appearing. Recommended bid is suggested based on averages across all advertisers on Twitter. With continued advertising, bids are adjusted based on the historical performance of campaigns. Top Tip: Twitter recommends setting bids at $1 – $2 to get started understanding that more competition will drive actual cots higher. If under a tight budget, set bids low and gradually increase to conserve budget. Conversion tracking will show people who completed an action on the advertisers website using an embedded code snippet conversion tags after viewing or engaging with promoted content on Twitter. Conversion data will be integrated into the campaign reporting. It will track click conversions and view through conversions or post view conversions. A post view conversion is for a user who views but doesn’t engage with the ad. Completed conversion actions can be tracked between 1 and 90 days. Twitter ads offer a great opportunity for brands to join in on the conversion by serving ads and tweeting content that is of interest to users. The most opportunity lies in the mobile ad component that makes up approximately half of the ad revenues Twitter is earning. Companies and brands that are mobile ready will have greater success as people access social media increasingly from mobile.